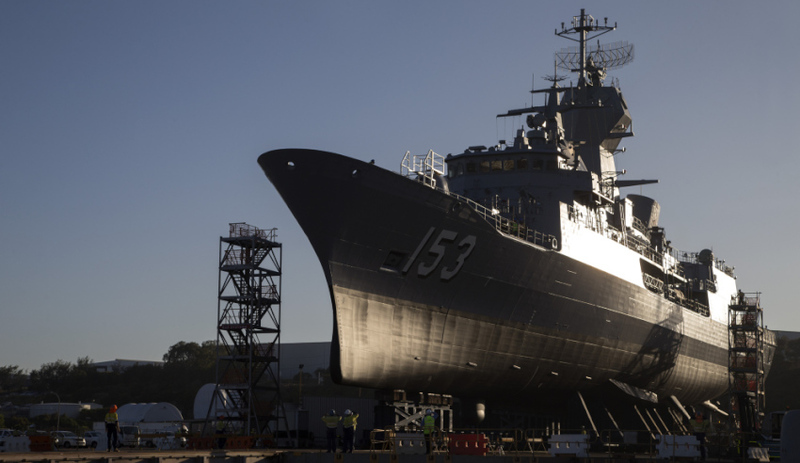 Naval Ship Management (NSM) has established a model to provide Australian businesses of all sizes with the opportunity to contribute to the nation’s sovereign industrial capability. Established in 2012 as part of a joint venture between Babcock and UGL, NSM has established itself as a leading provider for comprehensive maritime sustainment and maintenance solutions for the Royal Australian Navy and key platforms. NSM utilises a team of highly skilled professionals strategically located across Australia in conjunction with a robust, agile and scaleable supply chain. They provide cost-effective, responsive and customer-focused solutions that optimise the availability and capability of the Navy's critical assets. NSM general manager Joe Smith commented, "NSM as a joint venture between Babcock and UGL was formed initially to pursue the Anzac Group Maintenance Contract when it went to market in 2010. The JV allowed us to focus on the complementary strengths of both companies, which were brought together by an organisational synergy that allowed us to deliver a great value proposition for our customer." Headquartered at the Australian Marine Complex at Henderson, Western Australia, NSM provides an extensive range of maintenance and sustainment services across the Navy's portfolio, most notably the Anzac Class Frigates and from 2019, the Canberra Class Landing Helicopter Docks (LHD) and LHD Landing Craft (LLC). In 2012, NSM successfully won the Group Maintenance Contract for the repair and maintenance of the Royal Australian Navy’s Anzac Class Frigates and was administered by Anzac Systems Program Office (SPO), part of Defence Materiel Organisation (DMO), which has subsequently changed its name to the Capability and Sustainment Group (CASG). Building on this, in 2016 NSM secured a long-term contract, the Warship Asset Management Agreement (WAMA), for the sustainment of the Australian Anzac Class Frigates. The contract represents a strategic partnership between BAE Systems, SAAB, NSM and the Commonwealth of Australia for the sustainment and total asset management of the Anzac Frigates through to the end of their life. "Government started to realise that the old model of modernisation, maintenance and sustainment programs, which focused on a 'refit-by-refit' model, didn't exactly endear industry with certainty, confidence or any real incentive to invest in industry or workforce capability. However, the move to long-term collaborative contracts such as the Group Maintenance Contracts and most recently the LHD ACPC contract, provides the ability to effect similar long-term arrangements with our supply chain. This gives Small to Medium Enterprises a sense of confidence and optimism about the future and I think we will start to see a flow on effect of investments into Australian Defence capability," Smith explained. NSM's concept of 'Thin Prime' enables NSM to operate with a focus on lean, effective program and project management organisation. Supporting this concept is the implementation of a scaleable and diverse supply chain, which empowers the company to quickly adapt to changes in work volume, location and scope. "The way we designed the company enabled us to focus our expertise and people on where we would provide the most value for the customer. We recognised that there was no need for us to replicate capabilities that exist either under the defence or broader market guise, this is where the 'thin prime' model came from," Smith said. While NSM's specialised supply chain management and focus on delivering a scaleable response, drawing on a diverse supply chain including over 250 suppliers enables NSM to operate in a flexible, fluid manner, NSM's supply chain focuses on achieving high levels of Australian industry capability (AIC). Doing so facilitates the development of a robust sovereign maritime sustainment capability; NSM develops long-term contractual relationships with our supply chain partners. This focuses on long-term contracts, supports suppliers through investment in training, systems, equipment and facilities, all of which actively contribute to improved outcomes for industry and Navy. In addition, NSM's ongoing support for suppliers, through the Supplier Continuous Improvement Program (SCIP), is designed to accelerate the competitiveness of industry by raising performance of suppliers and focusing on embedding best practice leadership and a continuous improvement culture. "As an organisation, we take our commitment to AIC very seriously. Our individual suppliers understand that at no time do we want to compete with them, rather, they know that by helping us deliver outcomes for our customers that we are collectively successful, which provides follow on opportunities for NSM and our supply chain such as LHD ACPC," Smith said. "Our long-term relationships with our supply chain has been reinforced by the ongoing commitment, dedication and quality of our partners and the success of NSM wouldn't be possible without that same commitment and dedication." NSM's focus on supporting the development of a sovereign Australian naval shipbuilding and sustainment industry is key to maximising the government's policy for delivering a robust sovereign industry capable of supporting the $95 billion naval shipbuilding program. With a growing order book, NSM remains committed to delivering the best possible outcome for its customers, which is something Smith reinforced, saying, "The addition of the LHD program to our list of contracts will enable us to provide best practice sustainment, maintenance, engineering and asset management services to a range of critical Naval assets across the country. We are of course incredibly excited by this opportunity."